When looking at a piece of authentic jewelry, it should have a stamp in a discreet spot that tells you what the content of the metal is. or the purest form of gold, 24K (24 out of 24 parts), however, 24K gold is too soft for jewelry use. By doing the division of each number over 24, this will tell you the exact percentage of gold in the piece of jewelry. In silver, you will often see a three digit number such as .925 sterling or 925 sterling; this means that the metal is 92.5% sterling silver. For platinum, you will also see a three digit number such as 900 which means that it is 900 out of 1,000 parts or 90% platinum. Platinum may also be abbreviated on the inside of the ring or another discrete spot on the piece. Originally, carats were only used to measure the weight of diamonds, however, as of recently, it has also been used to measure gemstones. 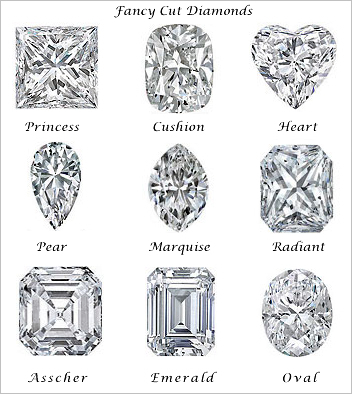 The carat weight of a diamond or gemstone varies, and typically, a 2 carat diamond will be worth twice as much as a 1 carat diamond. The same scale goes for gemstones, although different types of gemstones are not on the same scale. A 1 carat sapphire will differ in price from a 1 carat emerald due to the varied densities in the two stones.